Today we are interviewing Marilyn Z. Tomlins, author of the true crime book Die in Paris. I am English and I live in Paris. When I am not writing, I am reading what others have written. Indeed, I love books and I have over 4,000 of them in my apartment. I’ve been in the world of the written world for a long time, my first job, based in South Africa, having been on the editorial team of a media group. Next, having moved to Paris, I was a ‘stringer’ for another South African-based media group, covering general news. Fifteen years ago I had become the showbiz and royal correspondent for an Australian media group while I also began to do crime reporting. Five years ago I stopped all journalism because I wanted to write books: I did not have time to do both. Describe your true crime book in a few sentences. Die in Paris is the story of a most vicious killer: Dr Marcel Petiot. 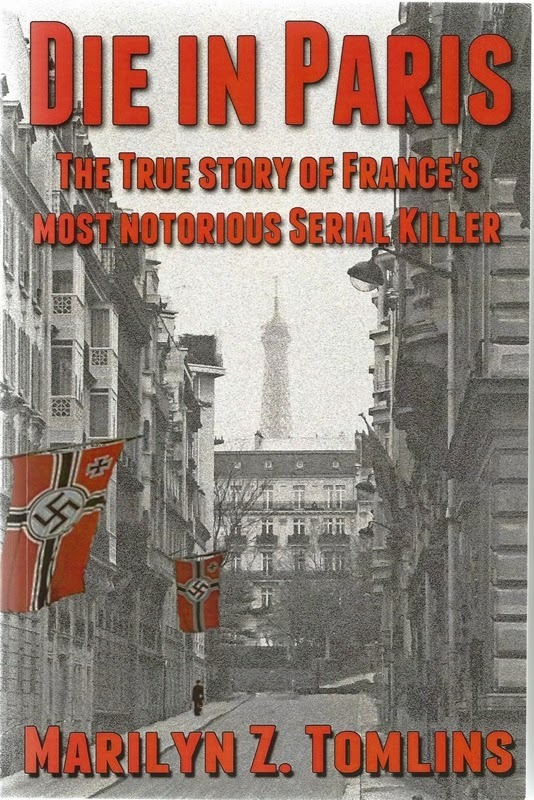 He killed in Paris during WW2, yet 70 year after the end of the war, he remains France’s most prolific serial killer. He was guillotined for having slaughtered 26 people, but the police chief at that time thought that he had murdered at least 200. His motive was money: having grown up a poor boy, he wanted to be wealthy and WW2 had given him that opportunity. France having surrendered to Germany and the Germans occupying the country, many people wanted to flee the country in order to be free from Hitler’s Nazis. Petiot told them that he could help them do so. He ‘sold’ them an escape route from Paris, but no such escape route existed: after having charged them enormous fees for his assistance, he killed them. What do you think would most appreciate this book? True crime readers. Also people who are interested in WW2, and indeed in France and the French. Die in Paris certainly shows a Paris which can not be called a ‘city of light’. What inspired you to write a book on Dr. Marcel Petiot? Petiot grabbed my attention when I first came across him when I was reading a book about France during WW2. He then would not let me go again. He certainly held on to me after I had discovered that I could see the cemetery where he lies buried from the windows of my apartment. So maybe he found me and I did not find him. Weird, I know, but so it was. You spent two years researching the story. Can you tell us a bit what that process is like? For those two years I ‘lived’ with Petiot: I had a most vicious killer in my head and there was no way I could get away from him. Or wanted to get away from him. The internet has made research much easier than it used to be, but there were only two books on Petiot in English, so I therefore had to do my research in French but fortunately I knew the language. There came a time when I no longer had space in my office for my research material, so I started to set it out in my living room. I am someone who still wants everything printed out, so whatever documents I had come across, I had to print out. Eventually I had such a massive amount of French documents to go through and which I had begun to translate to English, that I had to hire a translator to assist me. He worked well and fast – and I will be grateful to him forever: he passed away before the book was published. I had one disappointment when a ‘very’ close relative of Petiot – a man - would not speak to me. I had promised him that I would not reveal his identity or whereabouts in my book or in interviews. Still he would not speak to me. I’ve kept that promise as I still have not spoken about him to anyone. The fact is that I love doing research and I could certainly work as a researcher, so researching Petiot was not a problem. What techniques did you use to make this story come alive for modern readers? I just wrote the book as I had told the story of Dr Marcel Petiot to friends and relatives. I had as example Meyer Levin’s Compulsion about the Leopold and Loeb case published in 1956, and Truman Capote’s In Cold Blood about the murder of the Clutter family in Kansas published in 1966. Levin was the first to have written a true crime as a ‘non-fiction novel’ or a ‘documentary novel’. This is what I tried to do with Die in Paris. Also, I am a great admirer and reader of Ann Rule, so her style was an inspiration. What is the most interesting thing you uncovered while doing research on Dr. Marcel Petiot? About myself? That I do not scare easily. When I was a child I could not watch scary movies and later, grown-up, I still could not. I will tell you that I’ve not even watched one episode of ‘Star Trek’ because I found the faces too frightening. However, having lived so closely with Petiot for so long, it now takes some doing to scare me. About life? Not to trust people easily. Petiot’s victims trusted him, never for a moment having suspected that he was going to kill them. About writing books? It is amazingly satisfying. The assassination of Princess Diana. Or a book about Jack the Ripper. I’ve just written an article about Jack the Ripper which has done well on the internet among Ripperologists, so I am thinking of writing a book about him. I have my own theory about who he was. Murder is always fascinating and as Dr Petiot has not been ‘done to death’ as a book subject, Die in Paris will be a discovery. Also, the book is not only about a serial killer, but it is also about Paris and also about World War Two and the Nazis. Furthermore, Petiot was a handsome man – I think he looked like Johnny Depp – and his wife was pretty, and the murders took place, not in some back street, but a 5-minute walk from Paris’s Avenue des Champs-Élysées. It was always preferable that death should come quickly to the condemned. Therefore, Desfourneaux and his three assistants worked fast. They pulled Marcel towards the guillotine; they did not look left or right. They did not even seem to waste time to breathe. “Don’t look, gentlemen; this won’t be pretty,” said Marcel, looking over his shoulder at those who had come to see him die. He was smiling. The ‘gentlemen’ stood well away. They wore their best suits. Those too had been expensive and blood could splatter. Desfourneaux took Marcel by the arm and pushed him against the bascule, the guillotine’s vertically-positioned tilting board. Rapidly, two of his assistants swung wide leather belts around Marcel’s torso and legs and tied him to the board. They pushed the bascule down into a horizontal position until it was level with the lunette, the device that kept the condemned’s head in position. Desfourneaux was waiting and as the bascule came to a halt, he grabbed Marcel’s head and pushed it through the lunette. Suddenly, Marcel began to thrash about as if he wanted to get up and run away. With ease that came from years of experience, Desfourneaux, with both hands, held him down by the shoulders. Marcel calmed and became still; the reflex had passed, the storm had ended; he had accepted the abyss. He turned his head and looked and smiled at Desfourneaux. The latter’s face betrayed not a trace of emotion, but his left hand was moving towards the déclic that, when pushed down, would release the blade that would rob Marcel of his life. The blade was oblique. Such a blade had been found to be far more effective than a straight-edged one. A straight blade was inclined to crush the neck rather than to severe it. It made guillotining an altogether messier procedure. Desfourneaux’s third assistant was standing directly in front of the lunette, but behind a wooden shield that would protect him from Marcel’s blood. Between the lunette and the shield stood a wicker basket. As Marcel’s head appeared through the lunette, he grabbed it by the hair; it was imperative that a condemned’s head should not move. Had Marcel been bald, he would have grabbed him around the top of his head. Desfourneaux pressed the déclic. The guillotine’s blade was attached to a metal block known as the mouton. Its purpose was to add speed and force to the blade. The mouton weighed thirty kilograms; the blade seven. Three bolts that kept the blade in place weighed a kilogram each. That was a total of forty kilograms: it hit Petiot’s neck with a dull and very sharp thud. Marcel’s head fell into the wicker basket. It was the kind of basket as might be found in any office, but this one was lined with lead so that blood could not seep out. Marcel’s body, as lifeless as it was headless, laid stock-still on the bascule. Hastily, the two assistants, one on each side of it, pushed it into another wicker basket, this one long. It was also lead-lined and was large enough to hold four adult bodies. Dr Paul stepped up to the long basket. He had to establish death had taken place. He had always found that procedure such a ridiculous formality. He looked into the basket and nodded heavily. Marcel lay on his back. His arms were underneath his body. His legs were bent. Those who had witnessed guillotine executions, used to say that after decapitation, the eyelids and lips of the guillotined had continued to contract for five or six seconds. Rumour has it that Marcel had continued to smile and flutter his eyelids for at least twenty or thirty seconds after his head had been severed from his body. Some of the witnesses left the courtyard, got into their cars and drove off. Desfourneaux and his three assistants still had work to do before they too could go. They transferred Marcel’s body and head to a plain wooden coffin. They hosed down the guillotine, the basket into which Marcel’s head had tumbled and the basket into which his body had been pushed. They hosed the courtyard. All part of the service. Monsieur de Paris and his three assistants had nearly not turned up for Marcel’s execution. They had gone on strike for an increase to their 65,000 francs annual salary, and the 50 francs bonus they received for each execution. Since the increase had been promised, but had been slow in coming, Desfourneaux had threatened he would not be able to guillotine Dr Petiot; threatened with dismissal in return, he had said his machine was not in working order; it had been damaged during Allied bombing. In fact, Desfourneaux had efficiently guillotined Germany’s enemies— mostly resisters, some of them women— throughout the War. It was something that would sully his name until the day he died in 1951 of a heart attack, probably caused by the alcoholism and depression of his last years, years he had spent repairing bicycles. Just like Maurice Petiot. Desfourneaux had not become an executioner by chance; no one in France ever had done so; it was a profession that had run in families. Father to son; grandfather to grandson; uncle to nephew. He had two executioners in his family; his great uncle, Edouard Mathieu and an uncle Leopold. Wonderful. This sounds like a must read.